The EUR benefited from positive Brexit-related headlines but failed to make any decisive move. EU investors' confidence still dented by global trade concerns. 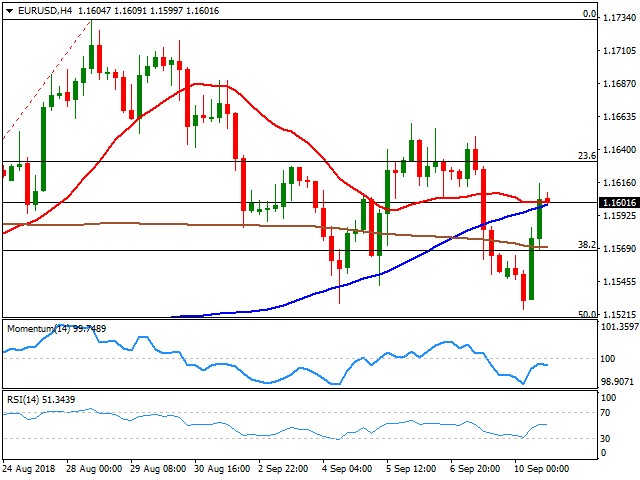 The EUR/USD pair recovered from a daily low of 1.1525 to settle around the 1.1600 figure, still trading within familiar levels. The greenback's momentum faded during the first half of the day amid the absence of negative political headlines, what helped high-yielding assets gain some ground. Headlines indicating that EU's Chief Negotiator Barnier said that is realistic to achieve a Brexit deal within the next two months, further boosted risk-related currencies, despite equities didn't perform that well in US trading hours. In the data front, the EU released the September Sentix Investor Confidence index which declined to 12.0 from the previous 14.7, also resulting below the market's expectations of 14.6. Limited intraday volatility could be attributed to upcoming first-tier events later this week, including an ECB monetary policy meeting. This Tuesday, Germany will release the ZEW Survey on economic sentiment for September, while the US has scheduled some minor figures such as Wholesale Inventories and the JOLTS jobs' openings report. From a technical point of view and according to the 4 hours chart, the pair currently offers a neutral-to-bearish bias, as it keeps struggling around its moving averages, confined to a tight 30 pips range and reflecting the absence of clear directional strength, while technical indicators recovered from near oversold readings but lost upward strength below their midlines. The pair has had trouble to surpass the 1.1620/30 area the immediate short-term resistance, with a stronger one coming at 1.1660. Above this last, the upside is favored, while the risk will skew to the downside on a break below 1.1530.